Most of us work in awful conditions. For example, I work in a windowless room with concrete block walls, no air flow to speak of, and fluorescent lighting. If we open up the doors to let the air in, then we’re stuck smelling what other people burn in the microwave down the hall. It’s really kind of horrible. 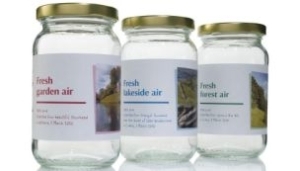 I must not be alone, because in order to reduce stress, the National Trust of Great Britain is putting out jars of fresh air to help relieve stress. Each jar contains enough fresh air (not chocolate air) to relieve stress for 10 minutes and they come in a variety of flavors; a few of them I can make out are garden, forest, and lake. I’m sure other traditional favorites like seaside air are there, as well. You can get a free jar of air by emailing press.office@nationaltrust.org.uk, though you probably have to be in Britain to get your air. If you could somehow make this a real product, possibly using chocolate air technology? That would be stellar. I’d love to be able to make my room or office smell like the fresh, salty air of the beach, without the artificial stink of chemicals from aerosol sprays.